Hunsdon Skip Hire provide Skips in Harlow, Epping & surrounding Essex areas. We are licenced for Skip Hire in Harlow or Skip Hire in Epping and have all sizes of Skips available for fast delivery from the local distribution site in Burnt Mill (Elizabeth Way), Harlow, Essex. Hunsdons are in all Harlow and Epping areas daily, so can offer cheapest prices for local Skip Hire in all places such as; Harlow Town, Matching, Hastingwood, North Weald, Ongar, Epping, Nazeing, Roydon, Stanstead Abbotts, High Wych, Sawbridgeworth, Hatfield Heath, Sheering and all Harlow suburbs. Our Waste Recycling & Transfer Station is just a short distance away in Hunsdon, Hertfordshire, where Trade and business waste can be disposed at our Recycling Station, with easy access and simple drive-on-off weigh bridge at the gate. 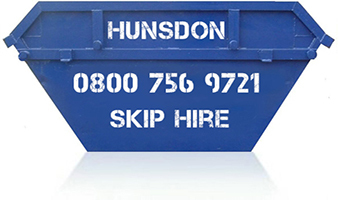 Hunsdons local Skip Hire efforts are to provide reliable low cost Skips for recycling in all Harlow locations, for Trade or Domestic use. Herts Essex Recycling, A & A, Frooms, JW Skips & more.